We finally did it; we bought a Keruig last month. 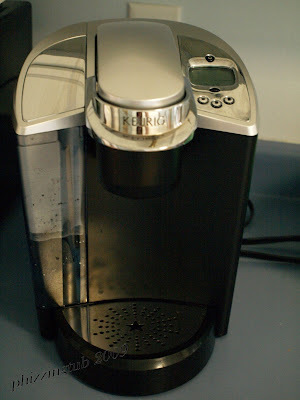 Our poor little Mr. Coffee was leaking water all over, we tried to squeak it out but in the end we had to admit it was time for a new coffee machine. I had been ogling looking a Keruig for quite sometime but simply could not just justify a reason to go out and buy one. Yet, here I was presented with the opportunity to purchase one and I became unsure. Dh had used one while away last year and just raved about it, so I knew it would be put to good use. We thought of how many times we would end up dumping out coffee because I really don't drink much of the stuff, a cup a week if that. We even have a little K Cup adaptor so I can brew my own tea or we can buy our own coffee. I have to say that this was one smart move by us and we totally love it! Lilly of the Valley - Finally! !